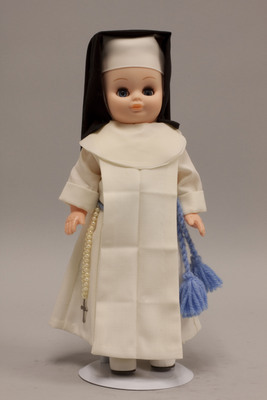 "Doll wearing habit worn by Sisters of the Good Shepherd"
Plastic doll is wearing a habit worn by the Congregation of Our Lady of Charity of the Good Shepherd, or the Sisters of the Good Shepherd. The order was founded in 1835 by Saint Mary Euphrasia in Angers, France. The doll is wearing a white habit, white collar, white scapular, white wimple, and black veil. A blue yarn cincture (belt) is tied around her waist, and a pearl rosary with metal cross hangs from the belt.